The city of Quanzhou is in sotheastern Fujian Province. It has an area of 11,000 square kilometers and a population of six million. Quanzhou is among the first group of cities designated by the state as well-known historical and cultural cities in China. It has a long history, a galaxy of talented people, and places of varied scenic beauty and historic interest. The city has time-honored, simple but unique folk customs. Confucianism, Buddhism, and Taoism shared a common prosperity there. The city's folk music, opera, dance, martial arts, fold customs, clothing, handicrafts, local and special products as well as snacks have a diversified splendor. Quanzhou's stone, porcelain, tea, Nanyin music, opera, martial arts, and other traditional cultural corms and handicrafts are popular both in the urban and rural areas and enjoy a high repu tation abroad. The city is a principal ancestral home of overseas Chinese, foreign citizens of Chinese origin, and compatriots in Taiwan, Hong Kong, and Macao. It stands in the north of Quanzhou as a natural defence, known for its exotic rocks and ingeneous springs. People of the Yuan Dynasty praised Qingyuan as the "first mountain at a fabled abode of immortals in the sea of Fujian." The "mountain peaks that stand opposite each other" is one of the ten principal scenic attractions. 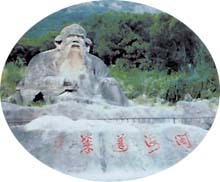 There are 36 best scenic spots in the peaks, including Lao Zi's Rock at the foot of Mount Luoshan and Mount Wushan features a sitting statue of Lao Zi, the founder of Taoism, carved out of a natural rock duirng the Song Dynasty. The 5.1meter-high statue, vivid and exquisitely carved, is the largest Taoist stone sculpture in China now under state protection. Built in 686 on Xijie Street of urban Quanzhou, it was called the Lianhua, Xingjiao, and Longxing temple before it got the present name in 738. It is a national historical relic under key state protection. Also called Wan'an Bridge, it was built between 1053 and 1056 by Cai Xiang, governor of Quanzhou, at the esturay of the Luoyang River on Quanzhu's northeastern outskirts. Originally, this huge stone beam bridge suspending the port was 1,200 meters long and 5 meters wide with 46 piers, 500 balustrade posts, 28 carved lions, 7 stone kiosks, and 5 stone pagodas. This magnificent bridge has a raft-style foundation reenforced by raisng oysters on the surface, a pioneering work in the annals of bridge construction in the world. It is in Penglai Mountain, Anxi County, where the secluded landscape is dotted with an elegant temple and other structures to become a well-known touriust area in southern Fujian. At first, the crag was called Zhangyan Crag. 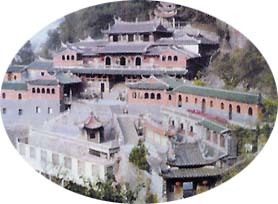 It was renamed Qingshui Crag by Chen Puzu, a Buddhist monk of the Northern Song Dynasty, and a temple was added later. The pavilion-style temple has three stories built according to the terrain. Down below in front of the temple is a deep valley, and four stalagmites rise up to the sky on the summit of Penglai Mountain at the back. 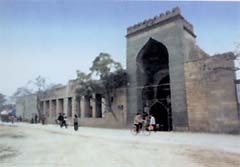 Also known as the Grand Aisuhazi Mosque, it was buit in 1009 on Tumen Street in urban Quanzhou. Both the builder and re-builder were Muslim structure in China is inthe Arab style of West Aisa. In the area of 2,100 square meters stands the gatetower, which is flanked by the Hall of Prayer on the west and Zhusheng Pavilion on the east. To the northwest is the Mingshan Hall, a threebay structure with a series of two courtyards, used as the Lesser Hall of Prayer. To the right of the Mingshan Hall are a reception room and an exhibition hall displaying Muslim historical materials. The town built of granite on Chongwu Isle in southeastern Hui'an County has survived the ages and stands virtually intact. Women living in the town are known for their graceful figures. They are to be found at the southern foot of Mount Lingshan outside the East Gate of Quanzhou. According to The Book of Fujian, four disciples of Mohammed, the founder of Islam, came to preach in China. The third and fourth disciples were buried in Mount Lingshan after death. Their tombs are two of the oldest, best-preserved holy resting places in the Muslim world. It was discovered in 1976 on the southwestern slope of Mount Pozhai in Baomei Village on the outskirts of Dehua county seat. The kiln was used to manufacture export porcelain during the Song and Yuan dynasties. Its discovery provides valuable materials for the study of the Maritime Silk Road.